Landlocked Kyrgyzstan is slightly larger than Austria and Hungary put together. It borders Kazakstan in the north, China in the east, Tajikistan in the south and Uzbekistan in the west. Nearly 95% of the country is mountainous: almost half of it at an elevation of over 3000m (9840ft) and three-quarters of it under permanent snow and glaciers. The dominant feature is the Tian Shan range in the south-east. Its crest, the dramatic Kakshaal-Too range, forms a stunning natural border with China, culminating at Pik Pobedy (7439m/24,400ft), Kyrgyzstan's highest point. The southern border with Tajikistan lies along the Pamir Alay Range. 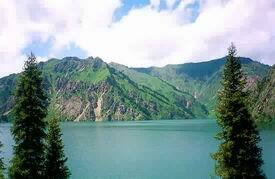 Lake Issyk-Kul, almost 700m (2300ft) deep, lies in a vast indentation on the fringes of the Tian Shan in eastern Kyrgyzstan. Though environmental pressures are as bad in Central Asia as anywhere, there's a reasonably good chance of seeing memorable beasts and plants, especially since Cannabis indica grows thick and wild by the roadsides. The mountains of Kyrgyzstan are the setting for high, grassy meadows - it's not unheard of to look out a train or bus window on the open steppe and see a rushing herd of antelope. Marmots and pikas are preyed upon by eagles and lammergeiers while the elusive snow leopard hunts the ibex amongst the crags and rocky slopes. Forests of Tian Shan spruce, larch and juniper provide cover for lynx, wolf, wild boar and brown bear. In summer, the wildflowers are a riot of colour. The climate of this mountainous region is influenced by its distance from the sea and the sharp change of elevation from neighbouring plains. Conditions vary from permanent snow in high-altitude cold deserts to hot deserts in the lowlands. From the end of June through mid-August most afternoons reach 32�C (90�F) or higher, with an average annual maximum of 40�C (104�F). During the winter months, temperatures remain below freezing for about 40 days. The coldest month is January when winds blow in from Siberia. Temperature ranges between -4�/-6�C (21-24�F) in January to 16-24�C (61-75�F) in July. In the highlands, the temperatures range from -14�/-20�C (6.8�/-4�F in January to 8-12�C (46-54�F) in July. There are heavy snowfalls during winter. Plant world of Tyan-Shan are different. The southern range slopes are covered by Tyan-Shan firs, there are nut forests, rowen trees, junipers. Alpine lawns are make colour and much medicinal heros. In summer there are keeping green plant, mild temperature, fresh air, much mushrooms and berries. For the botanic amateur will open a different kinds of plants. Animal's world. The tourist who is interesting about the life of wild animals and birds can see more wonderful in the fir forests, on the Alpine Lawns, on the highmountainarious lakes, on the coasts of mountain Rivers, in a steppe and in desert. We advise you to take a photocamera videocamera, and also copy their voices on taperecorder. There are 80 kinds of mammal in the country, more than 330 kinds of birds, about 50 kinds of fish, 12 marketable fish, about 30 kinds of reptile and amphibia. There are a lot of wild mountain sheep, goats, Marco-Polo sheeps, tyan-shan sheeps, which you can see on the canyons of mountains part. You also can see the rarest animals, which written in the Red Book, such as jairan, red wolf, snow leopard, tyan-shan sheep, Menzbir marmot and grey giant lizard Info the the Red Book are bring in 42 kinds of animals and 65 kinds of plants.